Mayor Ed Rieker today announced the City of Avondale Estates is on a short list of nine metro Atlanta cities working with Google to explore the possibility of bringing the ultra-high-speed Google Fiber broadband network to the City. Today’s average American broadband speed is 9.8 megabits per second. In contrast, Google Fiber could bring Avondale Estates residents access to “gigabit” Internet connections up to 1,000 megabits per second—or up to 100 times faster than basic broadband. Avondale Estates in April 2010 passed a resolution to respond to Google’s “Think Big With a Gig” challenge, which invited U.S. cities to tell Google if they’d want the company to build a new, gigabit-speed network in their community. Avondale Estates joined with four other cities under the name of “Atlanta Urban Area Partnership for Google Fiber” to craft a joint response and collectively bolster their chances of bringing the technology to the area. Watch a video about the partnership. There is huge consumer demand for faster Internet speeds, because no one likes to wait on the web. Unfortunately, many of the things people love to do online (like gaming, watching movies, video chatting) require a lot of bandwidth, which means that, using today’s connections, consumers often get stuck waiting for pages to load or for videos to buffer. Statistics show that people walk away from slow-loading sites. And gig networks aren’t just about meeting today’s speed needs. The next 100x leap in broadband speeds—to gigabit Internet—will lead to innovation that’s unimaginable today, just as the shift from dial-up to broadband did. Starting this week, Google will work closely with Mayor Rieker and City leaders on a joint planning process to explore what it would take to build a brand new fiber-optic network capable of delivering these gigabit speeds throughout the City of Avondale Estates. Google will begin compiling a detailed study of local factors that might affect construction plans. Simultaneously, Mayor Rieker and City leaders will begin meetings with Google to discuss what it would take to plan and prepare the City for a fiber project of this scale. 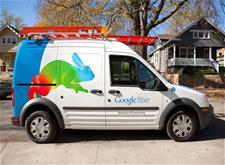 Google will provide an update on which cities will get Google Fiber by the end of this year. Google Fiber is an Internet and TV service that provides Internet connectivity, along with hundreds of HD TV channels. It’s currently available in Kansas City, Kan., Kansas City, Mo., and Provo, Utah, and will be available in Austin, Texas, later this year. For more information about this announcement, visit the Google Fiber blog. Residents interested in obtaining Google Fiber if it does come to the City of Avondale Estates may enter their addresses on the Google Fiber site.